Da Capo Press, 9780306814402, 344pp. On the morning of December 16, 1944, eighteen men of the Intelligence and Reconnaissance platoon attached to the 99th Infantry Division found themselves directly in the path of the main thrust of Hitler's massive Ardennes offensive. Despite being vastly outnumbered, they were told to hold their position "at all costs." Throughout the day, the platoon repulsed three large German assaults in a fierce day-long battle, killing hundreds of German soldiers. Only when they had run out of ammunition did they surrender to the enemy. But their long winter was just beginning. As POWs, the platoon experienced an ordeal far worse than combat-surviving in wretched German POW camps. Yet miraculously the men of the platoon survived--all of them--and returned home after the war. More than thirty years later, when President Carter recognized the platoon's "extraordinary heroism" and the U.S. Army approved combat medals for all eighteen men, they became America's most decorated platoon of World War II. With the same vivid and dramatic prose that made The Bedford Boys a national bestseller, Alex Kershaw brings to life the story of these little-known heroes--an epic tale of courage, duty, and survival in World War II and one of the most inspiring episodes in American history. 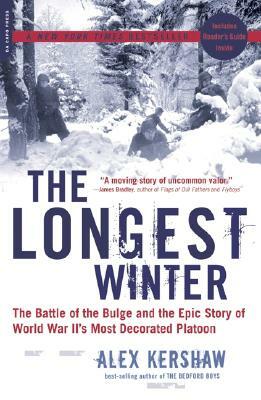 The Longest Winter is an intensely human story about young men who find themselves in frightening wartime situations, who fight back instinctively, survive stoically, and live heroically. Alex Kershaw is the author of the widely acclaimed and bestselling books The Bedford Boys, The Longest Winter, and The Few, and two biographies: Jack London and Blood and Champagne: The Life and Times of Robert Capa. He lives in Williamstown, Massachusetts. "This book is a must-read for anyone who wants a renewed sense of patriotism." "Kershaw is a fantastic storyteller and excels at describing small-unit action. Anyone who enjoyed The Bedford Boys would like this book." "America's enemies would do well not to underestimate this [platoon's] sense of courage3 and duty." "Gripping and unsentimental...Shows that valor comes in many forms." "Kershaw handles both combat and internment skillfully and respectfully. A good read for observing the 60th anniversary of the Bulge." "Kershaw has written a concise and winning account, one based largely on interviews with the platoon members. He vividly depicts the battlefield heroism and subsequent survival of these valiant American troops. Those interested in military history will find much here that is pleasing and heretofore uncelebrated." "A gripping, true life saga." "Kershaw...once again has succeeded in producing a fascinating, little known story. Amazing." "Kershaw skillfully tells the vivid and inspiring story." "This is a well-written book detailing the individual exploits of both American and German combatants. I required a second reading to better grasp the details of the individual experiences. I think that perhaps a third or fourth reading will be necessary to fully appreciate the impact of this incredible true story."